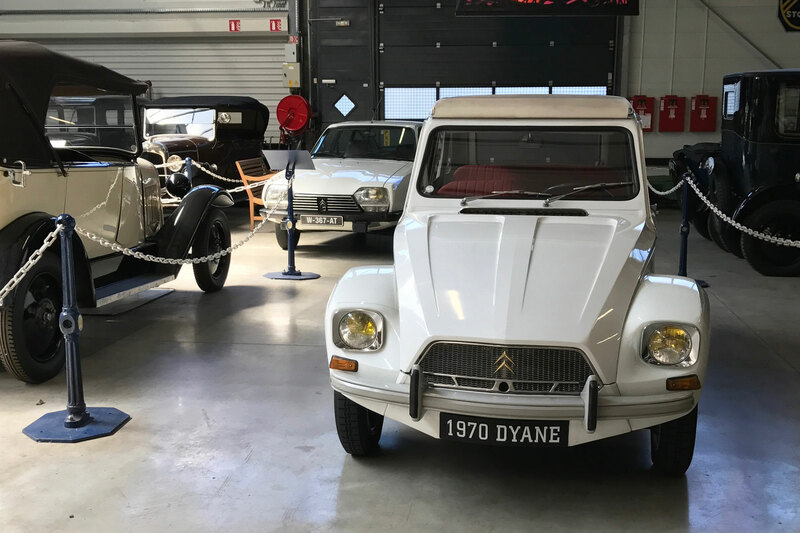 When, as part of our visit to the Conservatoire Citroen, I was asked if I’d like to drive a couple of the exhibits, my response was quick and obvious. The hardest part was narrowing the choice down from 400 to two. Opting for the Maserati-engined Citroen SM and hot-footing it down to the French Alps was a tempting prospect. As was spending the day leisurely touring the back roads of Provence in a Citroen DS 23. But, perhaps selfishly, nostalgia won the day and I selected two cars from my youth: a Citroen Dyane and a Citroen GS. I can’t quite figure out if my late father was a Saab or Citroen man, as our family owned an equal number of cars from each marque during my childhood. But one thing’s for sure, my father wasn’t a fan of mainstream motors, preferring the charms of the more eccentric and individual carmakers. And it’s the French connection that must have left a lasting impression, as I currently own three Citroens and can put my name to just two Saabs. The fact that the Citroen Dyane is celebrating its 50th anniversary in 2017 presented a good secondary opportunity to grab a quick drive. I use the word ‘quick’ with caution, as I was given strict instructions not to drive at speeds in excess of 30km/h, or a little under 19mph. Oh, and forget visions of Provence and the Cote d’Azur, as I wasn’t permitted to drive beyond the confines of the old Aulnay-sous-Bois plant on the northern fringes of Paris. No matter, because my sole experience of both the Dyane and GS was from the comfort of the back seats. A chance to play grown-up in the front was something I had waited too long to experience. If only my father was around to share the experience with me. His Dyane was the plusher and more powerful Dyane-6, registration mark XEL 32S. Ask me anything about my school days and I’ll respond with a Gallic shrug, but I’ll happily reel off a list of number plates attached to the cars of my childhood. Dad’s Citroen GS was a 1976 Pallas, registration mark LDY 935P. In both cases, the Citroens have long since departed for the big French scrapyard in the sky: the GS last taxed in 1984, the Dyane in 1991. Shame. First up for my trip down memory lane was the Dyane. “That’s the sound of my childhood,” I said to the Citroen PR man, as the twin-cylinder, air-cooled engine burst into life, before sputtering to a halt before it had left the shadowed coolness of the Conservatoire. “That’s also the sound of my childhood,” I said once again, as the Conservatoire resident mechanic tried in vain to get the Dyane restarted. With no joy, the Dyane was pushed unceremoniously back into line. Easy work when the car weighs about the same as a dozen packets of Gitanes. Enter plan B: a 1979 Citroen GS X3. By the time this particular car had rolled out of the factory in Rennes, the GS was into its ninth year of production, and yet it remained a technical tour de force in its segment. It was also preparing to make way for the more practical GSA, which would live on until 1986. Once again, the GS fires into life with the unmistakable sound of an air-cooled engine, only this time it’s a 1,299cc flat-four unit, the same one soon to be powering the forthcoming GSA. With 65bhp on tap, a top speed of 99mph was possible, not that I would be demonstrating this in the old factory workers’ car park. Settle into the supremely comfortable seats and it doesn’t feel like a car dating back to 1970. 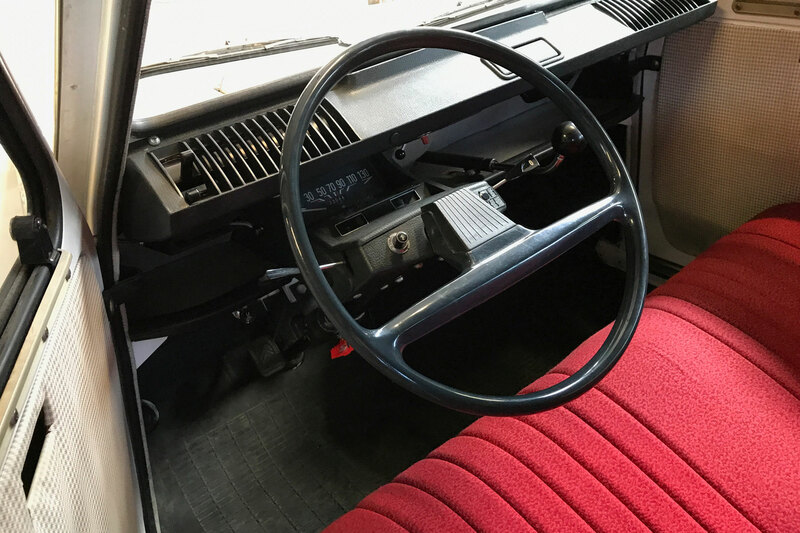 The GS hallmarks are there – single-spoke steering wheel, dash-mounted handbrake and wonderful circular display of dashboard lights – but it’s a measure of Citroen’s forward-thinking that it felt new and fresh, not least in 1979. It’s also incredibly easy to drive. All the controls are neatly positioned and the all-round visibility would shame even a modern convertible. Even in temperatures approaching 30ºC, there’s a sense that you could drive this all day, every day, although I wasn’t about to test this theory on the Peripherique. 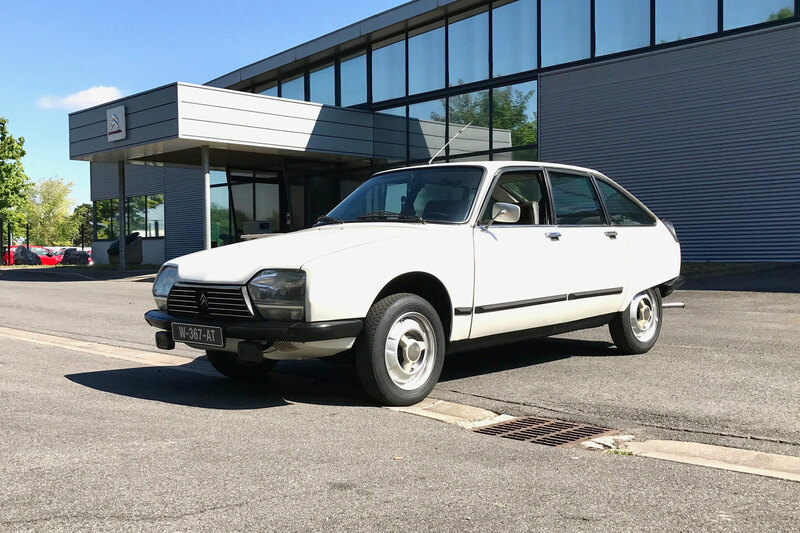 Let’s remember, the GS featured a simplified version of the Citroen’s famous hydropneumatic suspension, along with all-round disc brakes and an aerodynamic body that must have seen otherworldly in a segment of three-box saloons. That the GS didn’t feature a hatchback was a wrong put right by the GSA. There’s no power steering – it doesn’t need it – but even at the permitted low speeds (I did top 40km/h, but shhh), it turns in neatly and is utterly predictable. The clutch is light, the four-speed gearbox is smooth, with everything combining to create an effortless driving experience. The highlight, of course, is the suspension, which smooths away the imperfections of Aulnay-sous-Bois and makes even low speed cornering an absolute joy. Quite what it must be like on a French ‘Bis’ road is something I’ll have to imagine and plan for another day. While some cars might be thrown off line by potholes and drain covers, the GS behaved impeccably, steadfastly refusing to ‘hop’ in the same way I’d experienced in the C3 test car I’d driven to Paris. In fact, the GS completely outclassed the C3 in the comfort department. So much for progress. The brakes are also excellent, with a strong initial bite that gets more progressive with more force. Once again, I’m left with a feeling that the GS could be driven daily, although the rarity factor might encourage you to save it for high days and holidays. But what a tremendous thing to have parked in the garage. The Dyane is in the workshop, bonnet open, Yannick Billy hunched over the engine. My chances of grabbing a drive are slim, as time was ticking and we had strict orders to vacate the building by noon. But just as I was about to search for GSs on Leboncoin, Monsieur Billy wanders over with a split hose in his hand and a thumbs up. The drive is on. 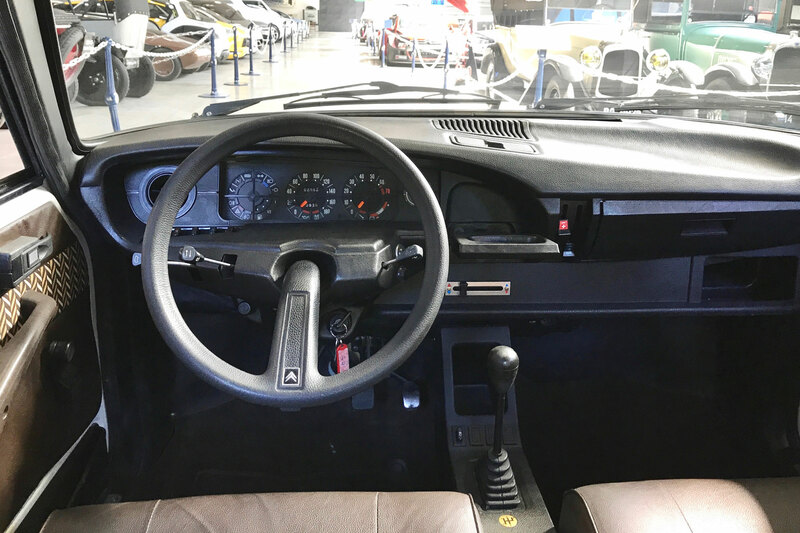 Although it is claimed that the Dyane was designed to replace the 2CV upon which it is based, it was certainly seen as model to occupy the space between its more utilitarian sibling and the Ami. Contemporary press photos show a more youthful clientele, with trendy young things doing whatever trendy young people do. I distinctly remember our Dyane-6 struggling to climb the 1 in 4 Devil’s Staircase on the Abergwesyn Pass, but feeling totally at home on the motorway. Thanks to its low weight, it didn’t require much in the way of power to give it a decent burst of acceleration. Citroen was keen to press home the price and practicality of the Dyane, with headlines such as “The lowest-priced 4-door car has 5 doors and a sunshine roof.” The hatchback certainly gives the Dyane a practical advantage, although the full-length canvas roof is straight out of the 2CV book. If the GS felt like something from the future, the Dyane was very much of its time. The cabin is stripped of all but the bare essentials, with a pair of benches to provide seating. It’s sparse, but certainly not stark. In fact, its simplicity is totally charming and a welcome antidote to the tech-laden, button-fest cabins of today. The Dyane was a car you could run on a shoestring, as there was very little to go wrong. To start, you twist the key and press a little red button situated beneath the top of the dashboard. The push-pull-twist gear lever protrudes from the centre of the dash and takes a while to get used to. I’m not ashamed to admit I stalled the Dyane – twice – and managed to shift from first to fourth, which made the car stall. Again. But once you’re accustomed to the procedure, it’s little short of brilliant. Soon I was touring the car park without drama, gathering enough pace to warrant third gear. I’d forgotten about the speed limit by then. Again, it’s the handling that shines through. The Dyane leans to almost comical levels when cornering hard, but the skinny tyres hold firm, enabling you to maintain terrific pace through a series of chicanes. 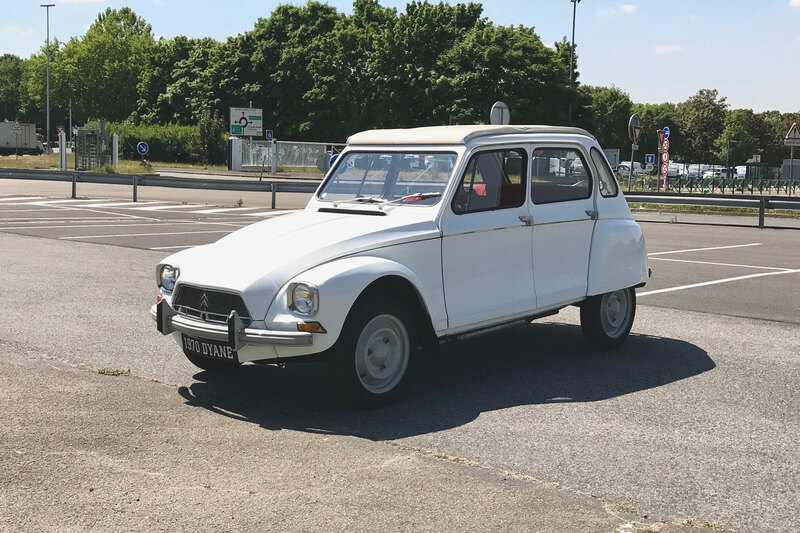 But just as I was getting carried away – and having thoughts of attempting a lunchtime drive through the centre of Paris – an almighty clunk was heard from the back of the Dyane and I limped back to the Conservatoire. Yannick gave it a knowing look as he drove the Dyane back into the workshop for another repair job. Needless to say, it would have been a quick and easy fix, because that was the beauty of the Dyane. Here was a car that could be repaired by one of the countless number of independent Citroen specialists that dotted the land before the rise of the franchised dealer. A car that sips fuel like your grandma nursing a Babycham at a Christmas party. Maybe the Citroen Dyane was ahead of its time after all. Sadly, it died in 1985, five years before the 2CV. Total sales of 1,443,583 puts it firmly in the shadow of the hugely successful ‘Tin Snail’, which amassed sales of 8,756,688 over a 42-year period. My drives were all-too-brief, but I’m left with the overwhelming sense that my father knew a good car when he saw one. Time spent in the back of these wonderfully eccentric and idiosyncratic cars shaped my love of motoring, and that’s something for which I can thank Citroen and my father.